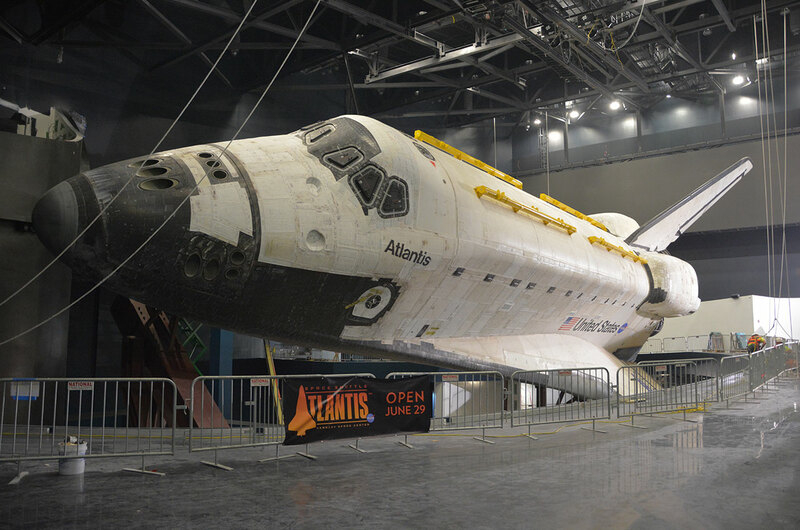 April 26, 2013 — Space shuttle Atlantis is ready for its spotlight — well, almost. 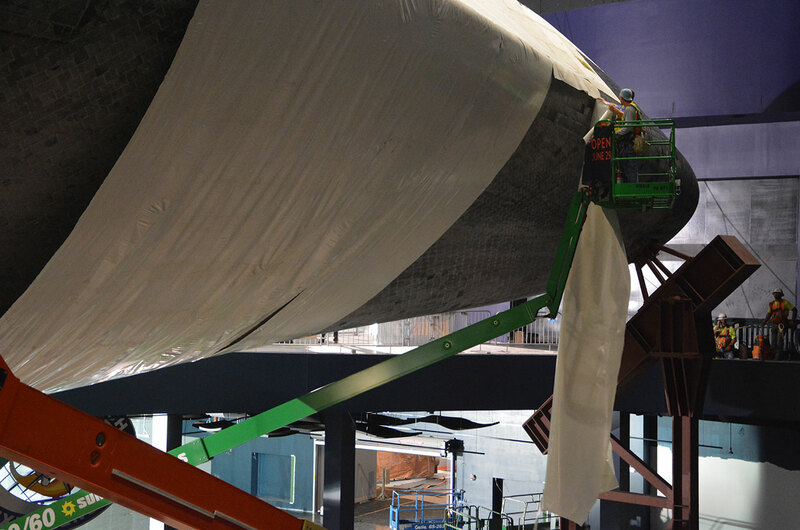 The retired NASA orbiter, which is set to go on public display June 29 at NASA's Kennedy Space Center Visitor Complex in Florida, was fully revealed Friday (April 26) after workers spent two days peeling off its protective shrink-wrap cover of the past five months. 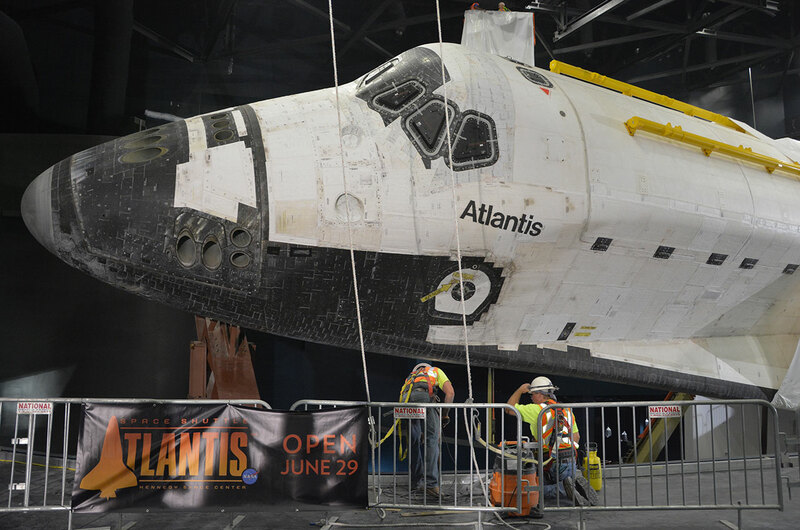 "It looks fantastic," Tim Macy, director of project development and construction for Delaware North Parks and Resorts, which runs the visitor complex for NASA, said after seeing Atlantis unwrapped. "It looks better than I thought it was going to look." 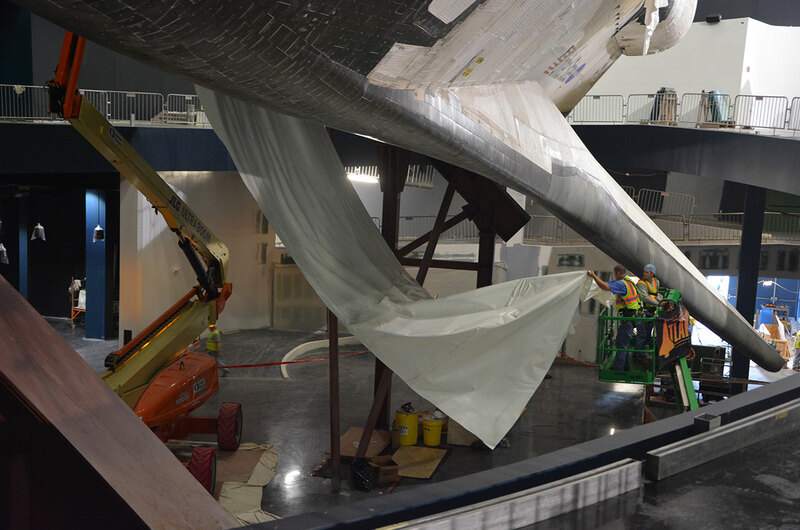 "It looks completely different with the plastic on it than the plastic off," Macy told collectSPACE.com. "But this is the way it is supposed to look. 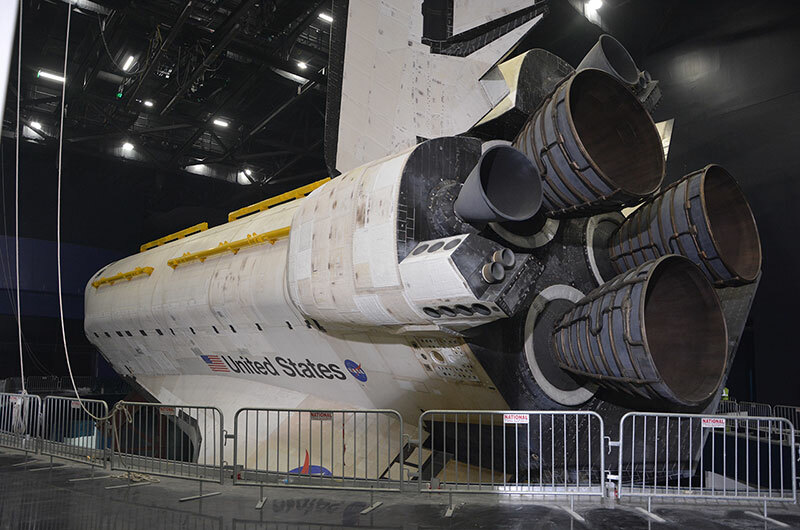 It looks so much like the [exhibit's conceptual] drawings." 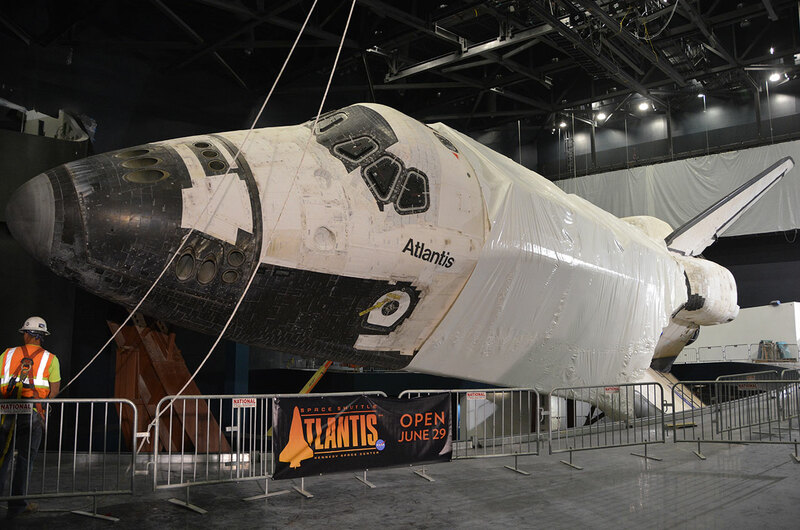 On Thursday, workers began carefully cutting back the 16,000 square feet (1,486 square meters) of shrink wrap that protected Atlantis as its $100 million exhibition building was completed around it. 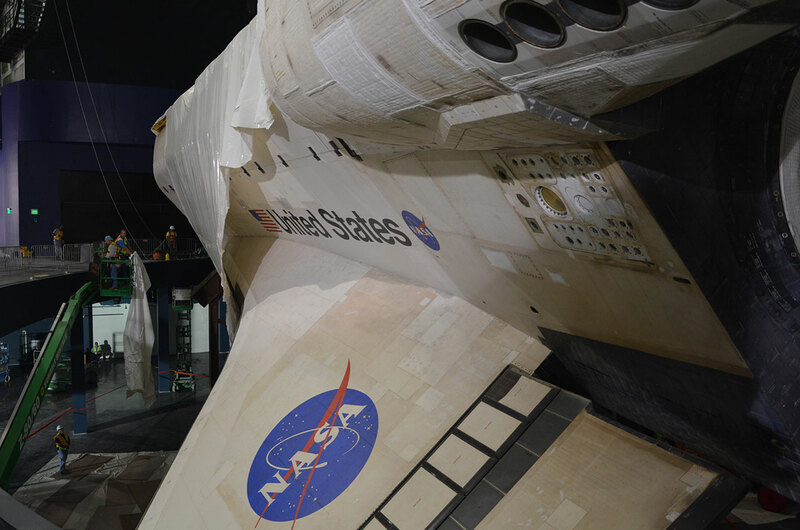 By the end of the first day, the shuttle's nose, tail, aft engines and left wing were exposed. 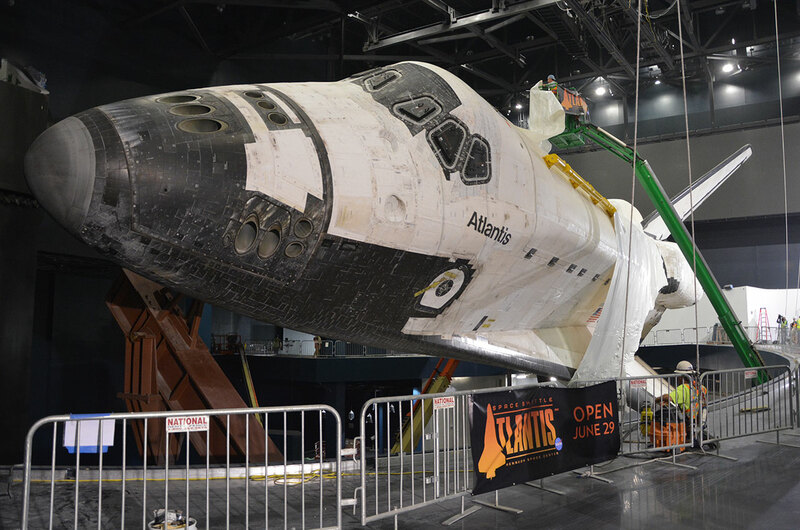 On Friday, the workers completed the process, revealing Atlantis' right wing and its 60-foot-long (18 meter) payload bay. 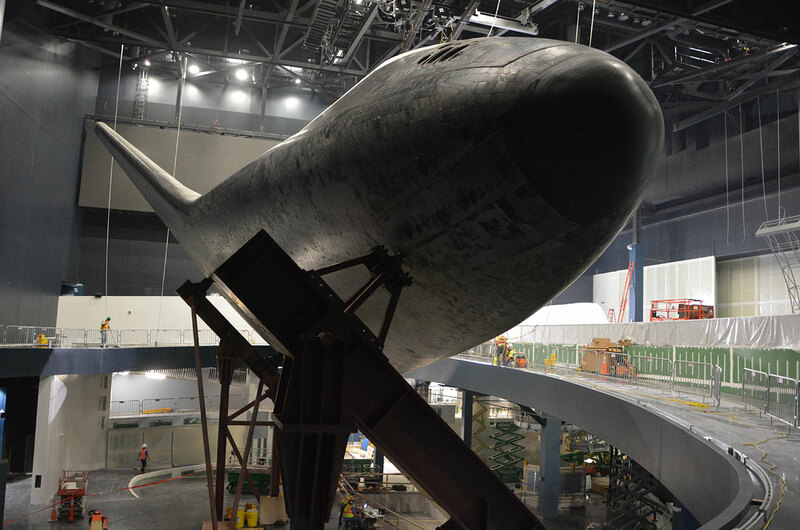 "I cannot wait to get the covers off the windows and get the doors open to see the final configuration," Macy said. Opening the payload bay is the last major challenge to ready Atlantis for display, Macy said. 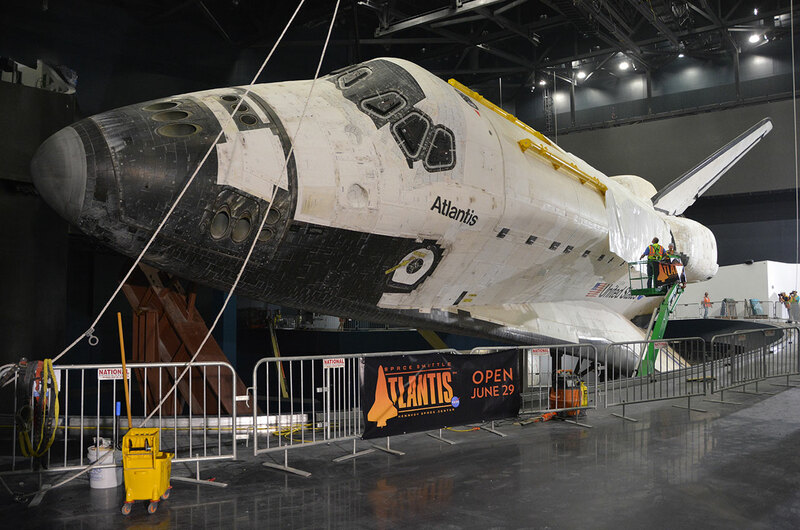 That process, which is set to begin in May, will take about two weeks, as the doors are very slowly hoisted open, one by one. 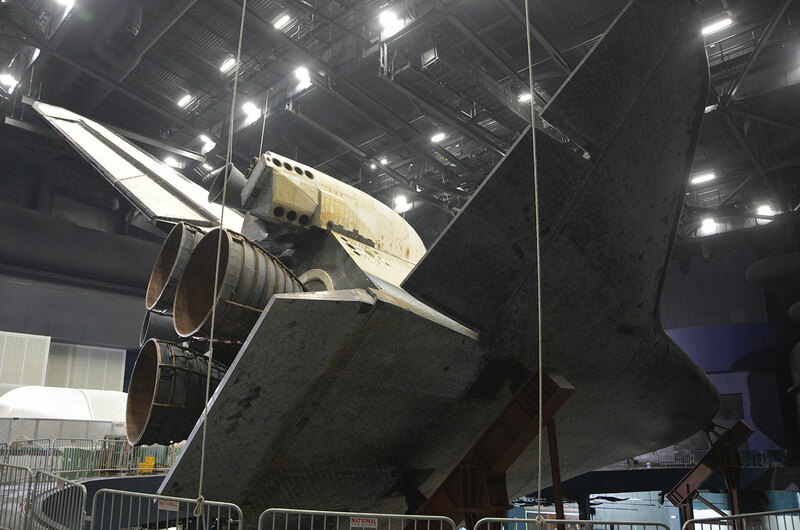 NASA designed the cargo bay to open in the microgravity environment of space. 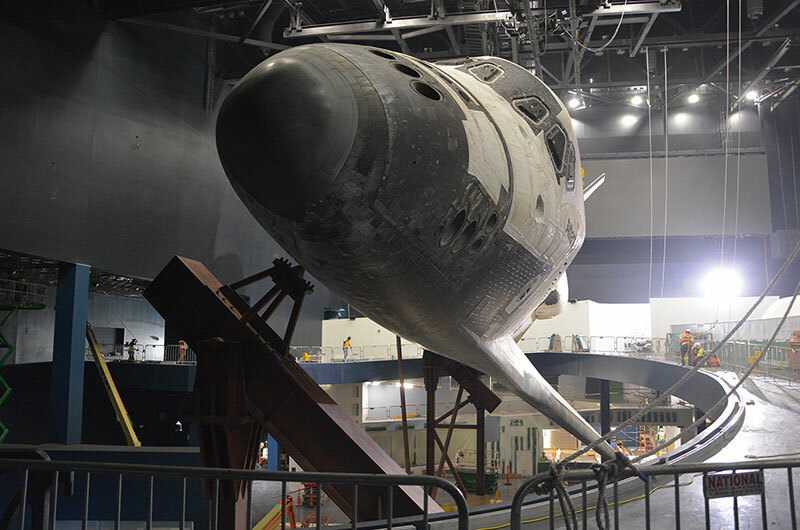 Here on Earth, the hinges cannot support the doors' weight, so lines dropped from the five-story building's roof will be used to hold the doors in place. 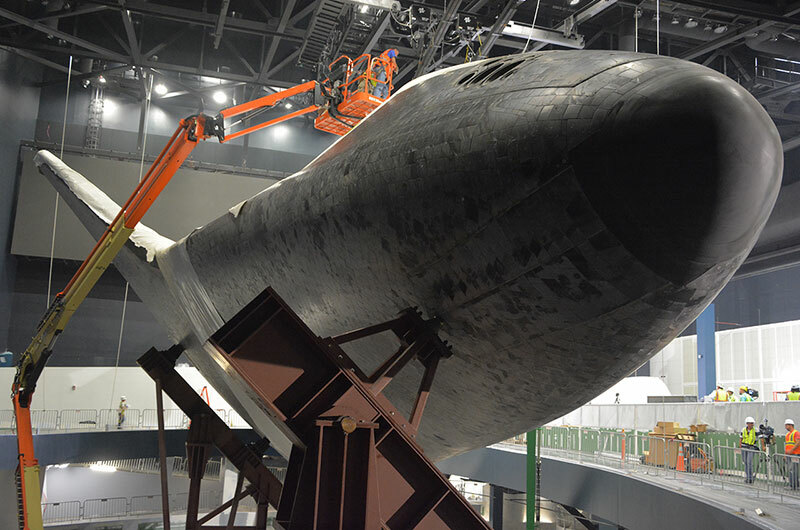 Once open, visitors will be able to easily see into the payload bay, given the way that Atlantis has been mounted. 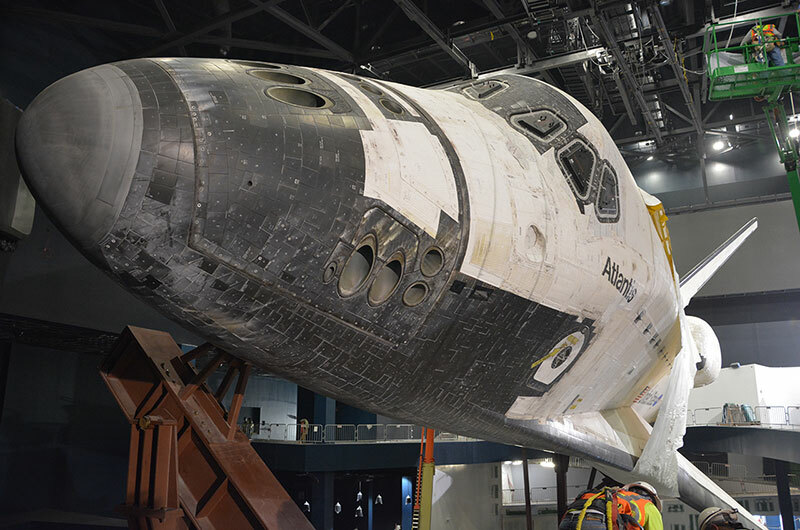 Thirty feet (9 meters) in the air, the space shuttle has been tilted 43.21 degrees, such that its left wing extends toward the ground. 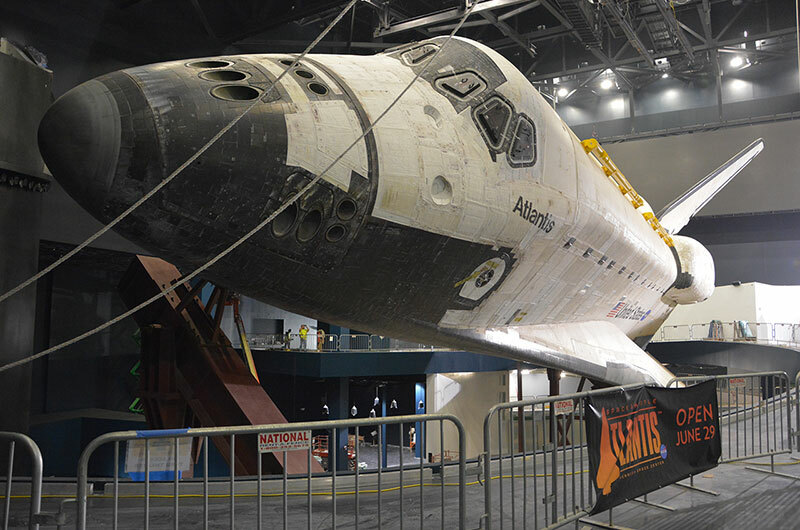 The end result is that Atlantis will appear to be back in space — an effect that will be enhanced by lighting and a mural-size digital screen that will project the Earth's horizon behind the shuttle. 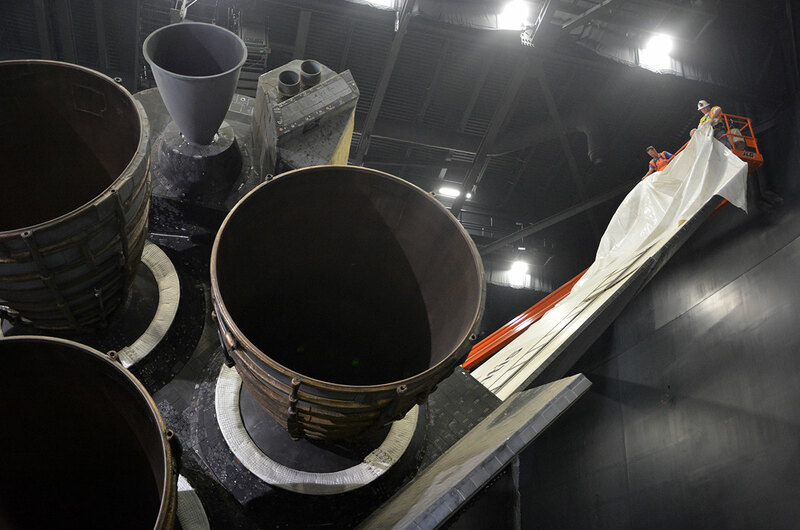 "It looks great even in the work lights," Macy commented. 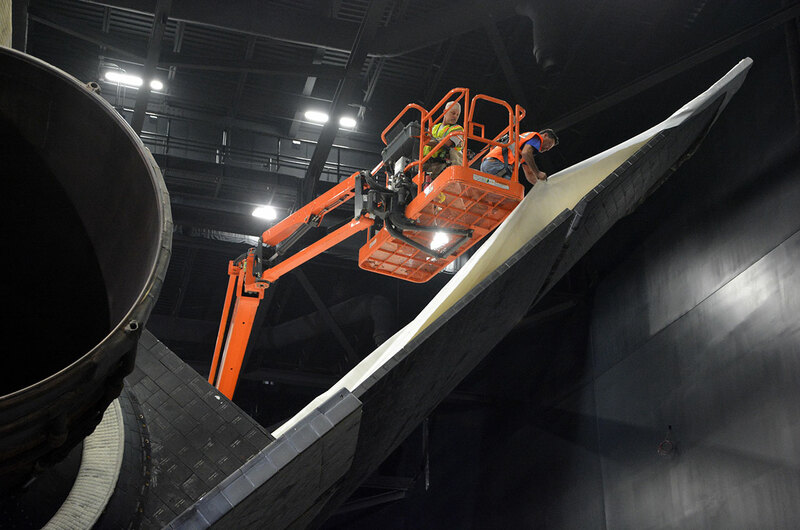 "Wait until we get the theatrical lights on it and light it the way we're supposed to, have that big screen going on behind it, it's going to be awesome."